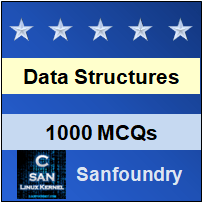 This set of Data Structures & Algorithms Multiple Choice Questions & Answers (MCQs) focuses on “Sparse Matrix”. 1. Which matrix has most of the elements (not all) as Zero? Explanation: Sparse Matrix is a matrix in which most of the elements are Zero. Identity Matrix is a matrix in which all principle diagonal elements are 1 and rest of the elements are Zero. Unit Matrix is also called Identity Matrix. Zero Matrix is a matrix in which all the elements are Zero. 2. What is the relation between Sparsity and Density of a matrix? Explanation: Sparsity of a matrix is equal to 1 minus Density of the matrix. The Sparsity of matrix is defined as the total number of Zero Valued elements divided total number of elements. 3. Who coined the term Sparse Matrix? Explanation: Harry Markowitz coined the term Sparse Matrix. James Sylvester coined the term Matrix. Chris Messina coined the term Hashtag and Arthur Cayley developed the algebraic aspects of a matrix. 4. Is O(n) the Worst case Time Complexity for addition of two Sparse Matrix? Explanation: In Addition, the matrix is traversed linearly, hence it has the time complexity of O(n) where n is the number of non-zero elements in the largest matrix amongst two. Explanation: For matrix to be Sparse Matrix, it should contain Zero elements more than the non-zero elements. Total elements of the given matrix is m*n. So if Total number of Zero elements > (m*n)/2, then the matrix is called Sparse Matrix. 6. Which of the following is not the method to represent Sparse Matrix? Explanation: Heap is not used to represent Sparse Matrix while in Dictionary, rows and column numbers are used as Keys and values as Matrix entries, Linked List is used with each node of Four fields (Row, Column, Value, Next Node) (2D array is used to represent the Sparse Matrix with three fields (Row, Column, Value). 7. Is Sparse Matrix also known as Dense Matrix? Explanation: Sparse Matrix is a matrix with most of the elements as Zero elements while Dense Matrix is a matrix with most of the elements as Non-Zero element. 8. Which one of the following is a Special Sparse Matrix? Explanation: A band matrix is a sparse matrix whose non zero elements are bounded to a diagonal band, comprising the main diagonal and zero or more diagonals on either side. 9. In what way the Symmetry Sparse Matrix can be stored efficiently? Explanation: Since Symmetry Sparse Matrix arises as the adjacency matrix of the undirected graph. Hence it can be stored efficiently as an adjacency list.